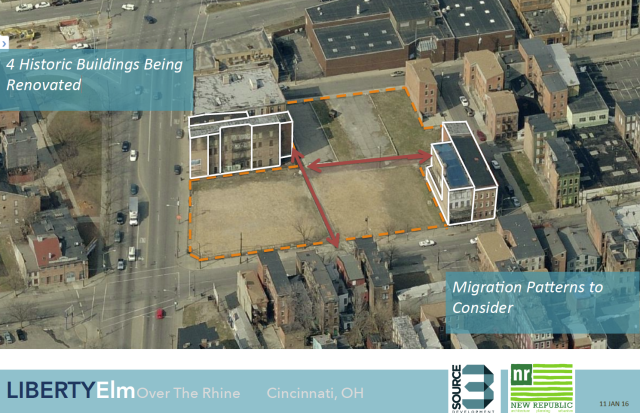 CINCINNATI, OHIO – January 11, 2016 – Source 3 Development, a Cincinnati-based developer, and its partner 224 W Liberty, LLC, also located in Cincinnati, are pleased to announce redevelopment plans for the northwest corner of Liberty & Elm Streets in Over The Rhine. The project is strategically located along the streetcar line between Findlay Market and Washington Park and will serve as a new southern gateway to the Findlay Market area. The project includes preservation of four historic properties as well as construction of a new mixed use building housing approximately 90 residential units and 15,000 square feet of ground floor retail. A new 3 level 165 +/-car parking garage is also planned for the project to support the residential and commercial parking demands of the project. With parking needs increasing in Over The Rhine, the development team felt compelled to provide on-site parking for the project, mitigating any potential parking burden for the neighborhood. Source 3 Development, LLC has 3 Principals, Ken Oswald, Craig Gossman, and John Heekin. Steve Tino and Brian Ross serve as Principals of 224 W Liberty, LLC. The partnership has engaged Graham Kalbli, New Republic Architecture, to provide design services and to assist the development team in the public entitlement process. Source 3 Development was founded in 2013 to pursue urban development projects in towns and cities throughout the Midwest. The company strives to develop projects in historically rich urban districts and neighborhoods where people want to live and entrepreneurs want to work. Currently Source 3 Development is working with the Marathon Petroleum Company on the expansion and development of their 116 year old corporate location in downtown Findlay, Ohio. Source 3 Development’s responsibilities included preparation of a master plan and long-term campus development strategy including ongoing project support for a $90mil expansion to the campus. The development team expects to break ground on the Liberty & Elm Streets project in the Fall of 2016 with apartment units and commercial space becoming available in the Fall of 2017. For leasing information regarding the project, contact Mike Heekin of Source 3 Development.